Photos show the tank shapes but are not necessarily the 5000 gallon size. We have 5000 gallon poly tanks in several shapes including vertical, cone bottom, and horizontal. 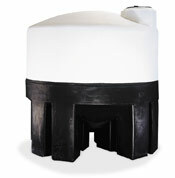 Some of our 5000 gallon tanks are available in more than one type of plastic. Polyethylene is the most widely used plastic resin for making storage tanks due to its relatively low price and good chemical compatibility. The polyethylene used is HDPE. HDPE (High Density Polyethylene) is sometimes conveniently but incorrectly referred to as HDLPE. Most of our 5000 gallon poly tanks are available in more than one specific gravity rating. We have some tanks that are rated for "Water Only", while others are rated at 1.5 specific gravity, 1.9 specific gravity or even 2.2 specific gravity. The Vertical Polyethylene tanks meet wall thickness standards set by ASTM D 1998. The ASTM standards were not written to apply to other shapes of tanks. If you are selecting a tank for chemical storage be sure to click on "Storage Applications" on the menu. You can select the chemical you are storing and find out the chemical compatibility with each kind of plastic and the materials of construction of the fittings. 5,000 GALLON VERTICAL WATER TANK 141 DIAMETER VERTICAL HDPE $1998.00 . 5,000 GALLON VERTICAL WATER TANK 119 DIAMETER VERTICAL HDPE $2019.00 . 5,000 GALLON VERTICAL WATER TANK 102 DIAMETER VERTICAL HDPE $2354.00 . 5,000 GALLON VERTICAL TANK 2.2SG VERTICAL HDPE $5779.00 . 5,000 GALLON VERTICAL TANK 1.9SG VERTICAL HDPE $4299.00 . INSULATED 5,000 GALLON VERTICAL TANK 1.5SG VERTICAL HDPE $7905.00 . INSULATED 5,000 GALLON VERTICAL TANK 1.9SG VERTICAL HDPE $8151.00 . 5,000 GALLON VERTICAL TANK 1.5SG VERTICAL HDPE $3499.00 .